This post is a little different – a little special. This is the month of giving of all sorts, so I thought I would take a little time and acknowledge another in this very same world you and I live in that IS making a difference. Last year, about this time, I became aware of the Hey Stranger Project. Started by a lovely woman Rachel May, who initially wrote handwritten letters of inspiration and encouragement, it is now spreading smiles and positivity WORLD WIDE! “These cards are something tangible that the recipient can choose to keep, to hold onto, to remember an act of kindness bestowed upon them, or they can pass it on to another. 2.Informal. hello: used as a greeting. Thousands of cards have been distributed all over this world making thousands of waves and thousands of stories. Rachel talks about Hey Stranger and you just know this lady is giving, positive and selfless. Rachel: a person I have never met but someone I look up to. I honestly can’t express the happiness that I receive when leaving a card for someone or handing a one at the drive through window. Why would I even try – YOU can participate, too! Join this random act of kindness project! 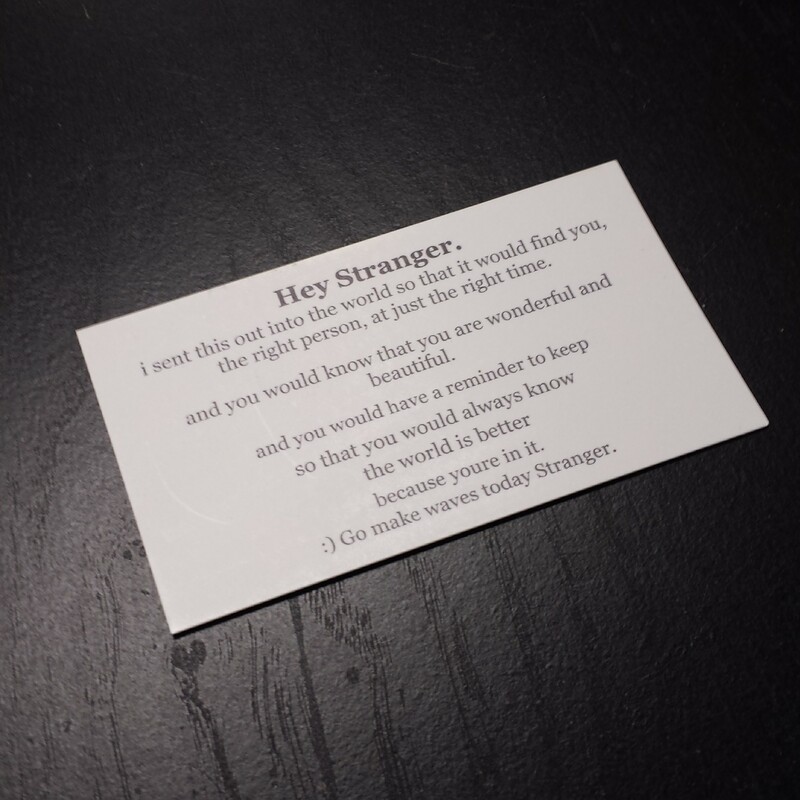 Follow her on instagram, @heystrangerproject, to find out how YOU can receive your own cards and get ideas about how they can be used.